An open education resource vendor has committed to following the CARE Framework for the care and feeding of OER available through its site, while also announcing that 90 percent of the resources in its own OER repository will be freely available to students. Top Hat, which has a cloud-based teaching platform and other digital learning tools, announced its "open content initiative," eliminating platform or subscription fees for access to its course content Marketplace. According to the company, 90 percent of the 20,000 digital resources, textbooks and other curricula in its repository are free. Other content is available for pricing between a few dollars and $86. The materials cover 20 different academic disciplines. All of the content is customizable by instructors; the original authors may choose to accept the revisions and share updated versions of their materials with those who have downloaded it. The CARE Framework is an open effort to ensure that OER creation and usage adheres to broader goals related to community contributions, attribution, release and use, and accessibility. In a blog article on Top Hat's website, Mike Silagadze, the company's founder and CEO, said the framework's principles would help "guide our stewardship of these open materials." The community contribution provided by the company is the organization and search capabilities the marketplace provides. All contributors receive "full attribution." Users that adopt the textbooks "can provide feedback and suggest enhancements to the authoring team, who can accept or reject the changes and push updates to new and existing users." And soon, he added, the OER will be subject "to the same community-review and revision process as the commercial textbooks available on the marketplace; and all OER derivatives will be openly licensed and remain free." Top Hat is working with Creative Commons to get its open licensing sorted out. 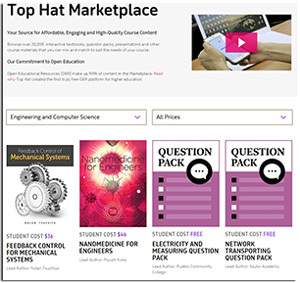 Top Hat will continue charging fees for Top Hat Classroom, a classroom engagement product; Top Hat Test, for administering formative and summative assessments; and its own commercial textbooks and other course content, which are available in the Marketplace. After an instructor has developed curriculum using existing content from the marketplace and adding his or her adaptations, students download a Top Hat app, create an account and enter a course code to receive access to the textbook on their devices. The company said access would remain free "for life." Joel Stake, a lecturer within the School of Biological Sciences at Louisiana Tech University, is one instructor who has assigned materials through Top Hat. In a prepared statement he said the company is "enabling access on a large scale so that educators no longer have to worry about how they're going to assign high-quality and relevant content that is also affordable. My own students use [Rice University's] OpenStax textbooks on Top Hat's platform, and now have the opportunity and resources to be successful in their coursework."